Timor Leste (TL) is one of countries significantly impacted by climate variability and climate change. In responding to this issue, the Government of TL has ratified the United Nation Framework Convention on Climate Change (UNFCCC) in October 2006 and the Kyoto Protocol to the UNFCCC in October 2008. Government of Timor Leste has also signed the Paris Agreement (PA) in 22 April 2016 and already prepared its comprehensive national climate action plans called as INDC (Intended Nationally Determined Contribution) prior to the ratification of the PA by the TL. Government of TL is currently undertaking various adaptation and mitigation activities. As a party to the UNFCCC, Timor Leste has an obligation to communicate its efforts to address climate change and to meet the objectives of the convention as well as constraints and needs for meeting the objectives. Government of TL has submitted its Initial National Communication (INC) to the UNFCCC and now in the process of preparing its second national communication (SNC). In the National Communication, TL will update the status of its emission and communicate steps taken to achieve the objectives of the convention (mitigation and adaptation) and needs for financial, technology, and capacity development which reported in its INC. In line with, since 2016, CCROM SEAP has been assigned by UNDP as international consultant to support implementation of activities of the Second National Communication (SNC) project and submission the Timor-Leste’s SNC to the Convention Secretariat under PS-UNDP 004/TLS/2016: International Consultancy on Initial National Communication for Timor-Leste under UN Framework Convention on Climate Change. CCROM-SEAP Team of Experts (CCROM-TTE) shall provide technical support and capacity building to the countries’ team in the preparation of the SNC until the end of 2018. 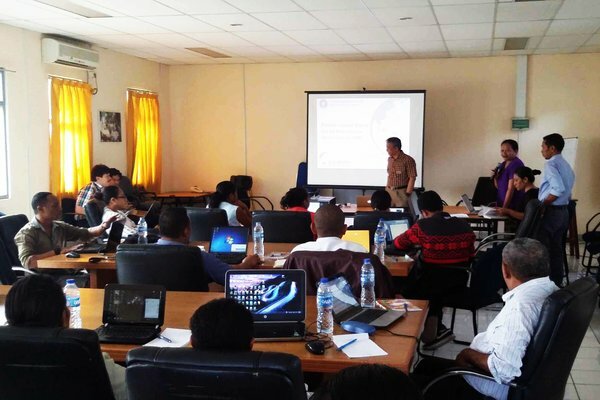 The first mission to the country has been conducted from 1 to 6 May 2017 in Dili, Timor Leste by conducting the inception meeting to secure high-level support from the Government and key stakeholders by introducing the project’s goals, activities and outcomes including its work plan for the Timor-Leste’s SNC. As well as to understand the existing TWGs and to identify capacity gaps in the context of the implementation of the project and to conduct training on GHG inventory for the country team.